Greencoat Properties was the final incarnation of The Improved Industrial Dwellings Company, having changed their name in 1958. By all accounts the estate had fallen into a poor state of repair by this point, and the newly formed Greencoat did little to rectify the situation. 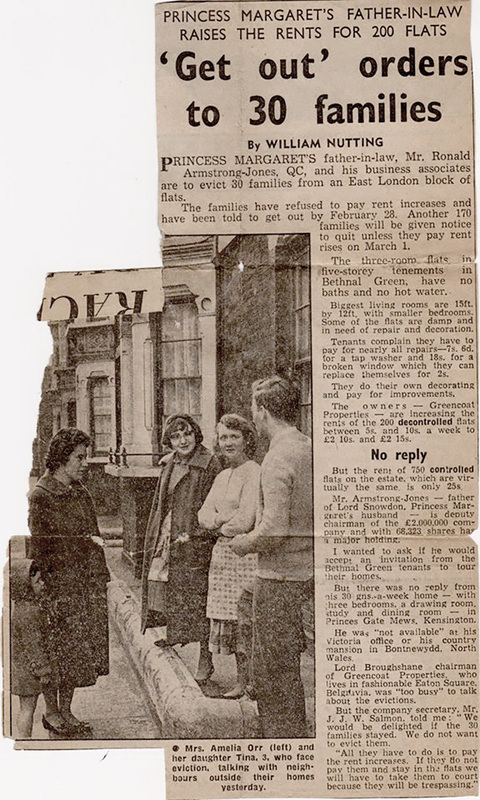 The poor state of repair along with an increase in the rent eventually drove the tenants to organise under the banner of The Greencoat Tenants Association and call a rent strike along with a march on the home of the company chairman Lord Broughshane (apparently they found his home empty on arrival). It seems that the publicity generated from the march had the right effect leading to questions being asked in parliament and eventually a compulsory purchase order allowing the local borough council to take over the entire estate in 1963. I have gathered a number of newspaper cuttings from various sources. “All the property of the Improved Industrial Dwellings Co. was disposed of, having by the early 1960s become ‘malodorous litter dens’”. There was an enquiry and Dr S.A. Boyd (the borough medical officer) examined the flats and found that they were ‘dark, ill lit and inadequately ventilated”. 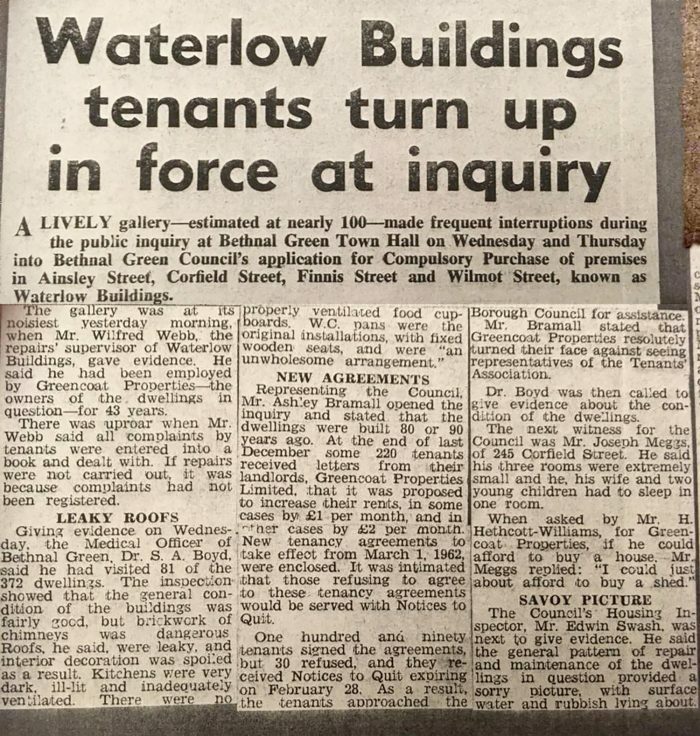 The letter added: “The Minister adds that he agrees with his inspector that the new rents are exorbitant for what the tenants are getting or seem likely to get.” The flats are in Waterlow Buildings. The order involves 198 of them and two shops with attached living accommodation. The buildings, which are 90 years old, consist of 102 terrace blocks, of which Bethnal Green council originally proposed compulsorily to purchase 21. In his letter to Greencoat Properties, Sir Keith Joseph said it was clear that there was a threat of homelessness which the Bethnal Green council was in no position to meet. Of the new rents, he said there was a conflict of evidence about whether these could be said to be in excess of market value. The flats in the estate have one to four rooms, plus scullery, with electricity, gas, and cold water and their own lavatory, but no bath. The gross values vary between £14 and £28. In the estate as a whole, the rents are from 4.4 to 6.5 times the gross value and the new rents in the flats covered by the order are from 4.4 to 6.2 times the gross value. The 30 tenants who refused to pay had been asked for between £1 and £2 a month more. At the public inquiry, Dr S. A. Boyd, the borough medical officer, said he had examined 81 flats. The kitchens were all less than 100 square feet, “dark, ill lit, and inadequately ventilated”. There was no proper food storage provision. The Minister’s letter of yesterday states: “The inspector has drawn attention to the poor condition of the property, to serious defects in maintenance and management, and the absence of any serious attempt to improve the property notwithstanding the progressive rent increases in recent years”. The Ministry of Housing statement said that the inspector in his report had concluded that there were 29 families under threat of eviction. Further details of the compulsary purchase order can be found on Hansard. 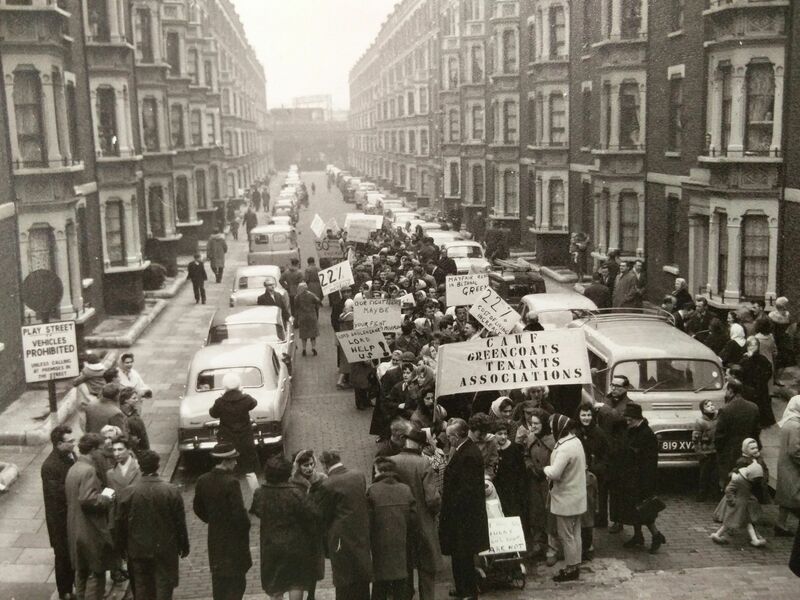 “Not sure if the Greencoats tenements association existed prior to the rent march / strike of 1962, if not it certainly started gaining strength from this time. They took the name from the landlords, and after Bethnal Green council took over the flats they never changed this name. I don’t know when they all started but by the time I was born in 1971, and old enough to remember, and until the time they disbanded in 1982, its main body of work was social enrichment of the tenants and their families. The various activities were financed by tenants paying “subs” which I think was collected by committee members visiting blocks and collecting from families every month. I am not sure if the subs were calculated based on number of people in a family or was a set fee per flat. I think these subs financed most of the activities but they may have required extra payment for some like the Association dance? 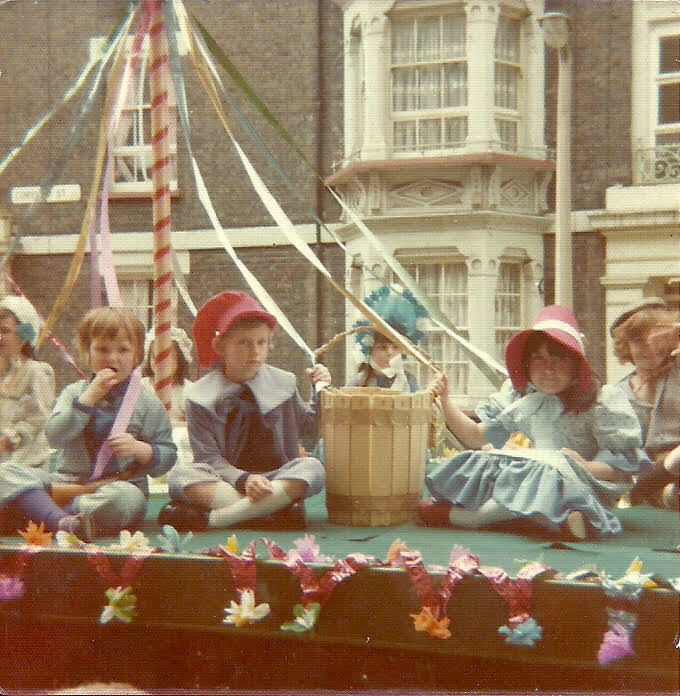 From at least the late 1960s (I remember years ago seeing some photos of some of the lovely floats) they organised and built a float display to enter into the annual Bethnal Green carnival. I took part in the last float they entered in Spring of 1976, where some photographs exist that myself and others have posted on the Facebook group page. The theme was “Nursery Rhyme Book”, with estate children gathered around a maypole as various nursery rhyme characters, with a older teenager sat at a throne as the Queen of Hearts, behind her is a giant story book made of hardboard, written on it the titles. of many nursery rhymes. I played little boy blue and can be seen not looking too happy as a five year old wearing a blue shirt and blue trousers! A lot of the costumes, I think were made by my aunt mine certainly was, who was a very talented seamstress and worked for many years in the “rag trade”. At that point in 1976 she had been working in the administration of a firm that was wholesale in providing shipping supplies to the industry, in a premises where a student accommodation block is located now on Three Colts lane (after the garage). I mention this as those admin skills were put to good use in the organisation of the tenants association. Everyone that was on or helped on the Greencoats committee had a skill/skills that would come in handy for events like the carnival. My uncle and Dad, and some of the other men, were good with carpentry skill when needed. Other float themes from previous years I know of included children’s fantasy films at the time, “Bedknobs and broomsticks” and “Chitty Chitty Bang Bang”. With the chatty chitty bang bang float they were very close to winning. The team of residents/committee members built the frame of the car themselves but did not win that year as I believe there was a rule that everything had to be original, and judges were convinced they a real car frame as the model was used as it was so convincing. I think my aunt held some trophies in her cabinet for many years, as I do believe Greencoats may have won at least once and come second or third place on other occasions. About 18 years ago I saw some photographs and an invitation from one of the parties, in my aunts photograph albums, held at Oxford house in 1968. Belinda, admin of the Facebook page, has memories. 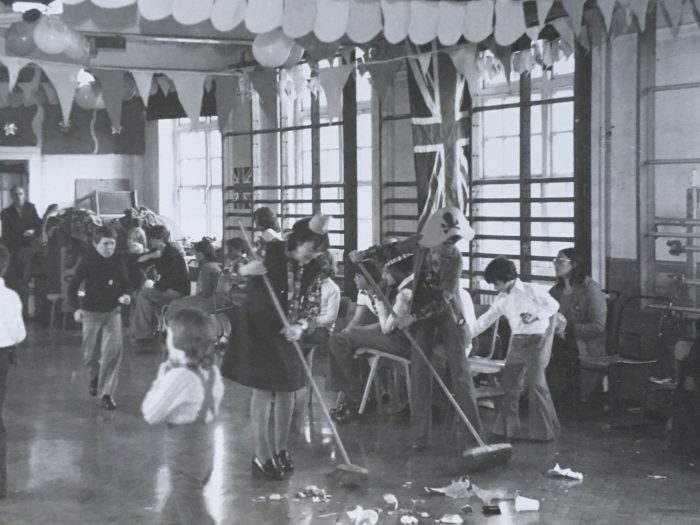 Of these parties in the mid 1960s being held at York Hall. I don’t remember these and have a feeling they stopped at least by the early 1970s, and instead they organised the June/July annual. Children trip to Windsor Safari Park (now Legoland) or Chessington Zoo (now Chessington World of Adventures). The estate had quite a lot of OAPs mainly living in ground or first floor flats on Corfield but some still living in Wilmot Street. These were annually on a Saturday in June/July close to the children’s outing. This was an annual coach trip put on for the OAPs on the estate, to a seaside place, I remember several times to Margate. These were well organised and held in the courtyard triangle area back of eastern side of Wilmot and western side of Corfield. I have seen family photos taken of these held their from 1960s, but I personally only remember. one being held in the summer of 1976. Held from at least the late 1960s, the last one I clearly remember being in 1980. It was held in York Hall and was a formal dance evening with disco, a. bar and food put on the by the tenants association. One of the annual highlights was a net full of blown balloons would descend onto residents near the end of the dance! As I needed to be baby sat in the 70s my mum or dad would attend but they always bought me home one of the balloons! Friends and family of tenants also attended, so I think it was financed by the purchase of a ticket. This was a large event which are remember with fond memories of my family, and neighbours that are on the facebook page. The original plan was to have a children’s Street party with trestle tables lining the northern end of Corfield. The evening was given over to a disco/party for the enjoyment of the adults. Sadly, it never took place on Corfield but was held in the first floor hall of Hague School due to the inclement weather. I think the intention was to always have it on Corfield Street but they had Hague School as a standby. I have fond and vivid memories of seeing the adults including my Dad help put up three large union jacks, during a weekday summer evening a day or two before, that were hung along the north end of Corfield attached from 4th floor (I think) stairwell window landing of a block on west side to a block on the other eastern side. The children’s part had the usual food, a puppeteer children’s entertainer, fancy dress, and at the end each child got a goody bag including a jubilee Mug and 25 pence commemorative “crown” coin. Most children on the estate I believe went to Hague School with a scattering going to the nearby Stewart Headlam named after a well known clergyman who for a time, who I believe is well known as material about him is on the internet, he lived in a flat on the eastern side blocks of Wilmot (there is a dedication plaque on the last block. Before Finnis St, which you might have seen? ), the only person relatively well known to live on the estate. I do not recall the precise reason for it, but the activities of the tenants association seemed to suddenly come to a halt by the end of 1980. This was the last year of the children’s and pensioners trips and the last association dance. It may have stopped as some of the committee members did not live on the estate anymore, my aunt and uncle moved in August 1981, and some of the families started to move away, but this was before the scaffolding / structural problems where everyone moved out in the mid 1980s. Some association funds were left from the work of the tenants association and this was used to finance a trip in early 1982 to Disney on Ice at Wembley Arena, after that the Greencoats Tenants Association was no more.